If you are looking for a special treat your children can give their friends at school for Halloween, these Pumpkin Cookies are the one to make! Simply put one in a plastic bag and tie with an orange ribbon! This recipe is time consuming, but well worth the effort since it’s as delicious as it looks. You will need to purchase a candy corn cookie cutter to make the cookie shape. – Cream the soft butter with the sugar until the combination is smooth and not grainy to the touch in a mixing bowl. -Add eggs and continue to mix. -If icing is not stiff enough add 1/4 Cup powder sugar. -The second bowl of icing, add several drops of black gel food colouring. Stir to mix. -The third bowl of icing, add several drops of green food colouring. -The fourth bowl stays white. -Spoon each colour of icing into individual frosting bags with a #2 tips. Twist the open end of the bag to push the icing to the tip. -Squeeze the majority of the white icing into a bowl then add 1 tsp of water to this icing and stir to mix the water and icing together. -Using the orange piping bag, pipe an orange line around half of the candy corn shaped cookie. -Fill in with the thin orange icing. -Add some green dots to the pumpkin on the corners. -Pipe on a face for the pumpkin. -Pipe a black line of icing around the edge of the top half of the cookie. -Add in a half circle of white, sprinkle with some sprinkles. -Let dry for another 4 hours before bagging or enjoying. I hope you enjoyed my Halloween Pumpkin Cookie recipe . If you make it, make sure to share with us on Facebook or Twitter! Also, check out all of our other Halloween Recipes. Divide the icing into 4 equal bowls. The second bowl of icing, add several drops of black gel food colouring. Stir to mix. The third bowl of icing, add several drops of green food colouring. The fourth bowl stays white. Squeeze the majority of the white icing into a bowl then add 1 tsp of water to this icing and stir to mix the water and icing together. Using the orange piping bag, pipe an orange line around half of the candy corn shaped cookie. Fill in with the thin orange icing. Add some green dots to the pumpkin on the corners. Pipe on a face for the pumpkin. Pipe a black line of icing around the edge of the top half of the cookie. Add in a half circle of white, sprinkle with some sprinkles. Let dry for another 4 hours before bagging or enjoying. These are really unique and adorable. Very time consuming but also very cute!! Those would so cute for a party. Okay I think I definitely have to make these with my kids this October!!!! 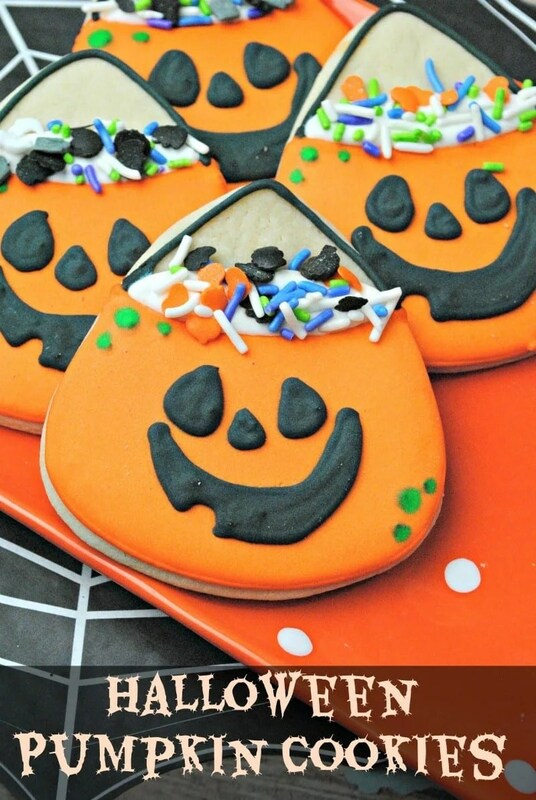 These are just the cutest cookies for Halloween! Thanks and so do I! I really like the sprinkles which you put on the rim above the orange. Nicely done! These cookies are so cute! I think I have to make them. These cookies are really cute but it’s summer and I’m not ready for Halloween yet. Love them,you have so many great recipes!